Soil blockers are a great way to start seeds for your garden, but some of the soil blocker recipes you’ll find around the web aren’t exactly sustainable – including things like peat moss and artificial nutrients. I’ve tried to take the general ideas from other recipes, and make a more environmentally-friendly soil blocker recipe mix. 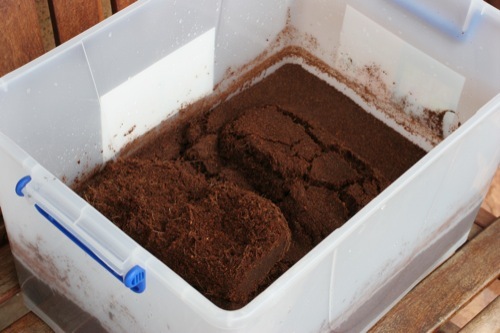 The main change is to use coconut coir instead of peat moss. It provides similar water-holding ability, and has coarse fibres that help hold the blocks together. Mix it all up thoroughly in a wheelbarrow, adding water to keep the mix nice and moist. It really needs to be fairly wet to form nice blocks. Once mixed, plunge the block maker into the mix and squeeze the blocks out. Lay the blocks out on wooden boards or in potting trays. After planting seeds in them, I put them on shelves in a little mini-greenhouse to keep them warm and moist. 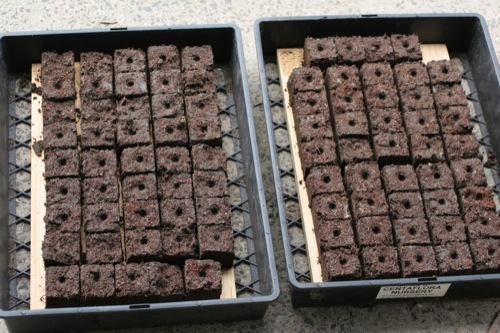 From these quantities I get a bit over 150 of the 2-inch soil blocks. Here’s a helpful discussion of environmentally sound ingredients for soil blocks (found via Permie.net). If you know of any more soil blocker recipes or tips, please post them in the comments below and I’ll update this list. Thanks! All great advice, and I’d never come across a “soil blocker” before! Wouldn’t using worm castings and compost introduce a lot of other stray seeds into the mix? My experience is that whenever I use my wonderful compost in the garden, millions of tomato seedlings come up. Which isn’t a problem in my case, but could cause problems when seed raising? I agree with James, using worm castings which has any sort of seed in it, will likely result in the seeds germinating (same goes for the compost which was not made using a hot compost method). If you had worm castings made from cow manure or some other animal with multiple stomachs then this should not be a problem. The worm castings would provide the stickiness for the soil blocker mix, so another alternative would be to use some soil with clay particles in it. As seedlings do not need the high nutrients contained in the worm castings, you should not see a difference in the performance of the seedling. Good points, James and Jason. I haven’t had much of a problem – occasional weeds sprout, but they can just be pinched off. Since you know your good seed was planted in the dimple in the centre of the block, you don’t need to know how to recognise your wanted seedling as it sprouts. Anything not in the dead centre is a weed! That said, I wouldn’t use a really ‘seedy’ compost in these blocks. Too much work. Jason’s idea of using soil would work just as well. I’d sieve it to keep the particle size small, too. @Shane: It sounds like a soil blocker would help you. Let me know if you try it, I’d love to see photos and hear of your experience. @Mike: I haven’t peat before. It’s not really something you see for sale much here in Australia, I guess because we don’t have much in the way of peat bogs so it’d have to be imported. I have heard other people say that the coir works just as well as peat. This is something new to me. Very interesting though. I have used heavy clay with soil before and found this to be OK, but looking at these pictures has got me thinking. It looks like I will have a new project for 2011 ……… soil blockers, I will let you know how I get on. Check the whole range of soil blockers out at http://www.soilblocker.com.au They are available in Australia now and can be shipped across the country.